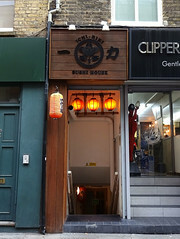 Sushi restaurant in Westminster, hidden away on a basement on Strutton Ground market. It sounds like it's either cosy or cramped, depending on your point of view. Opening hours taken from the Ichi-Riki website, January 2019. Last edited 2019-01-14 15:38:55 (version 7; diff). List all versions. Page last edited 2019-01-14 15:38:55 (version 7).